Guys. It is really freaking cold outside. I know I'm a southerner, and I have a low tolerance for cold weather, but come on. Below freezing in November? This is Georgia, not Minnesota! I know the rest of the country is experiencing the same low temperatures, so let's all bundle up together and eat comfort food, sounds good? What kinds of foods do you eat when it's frigid outside? I always go for soups, stews, and chili. They are the quintessential cold weather food. 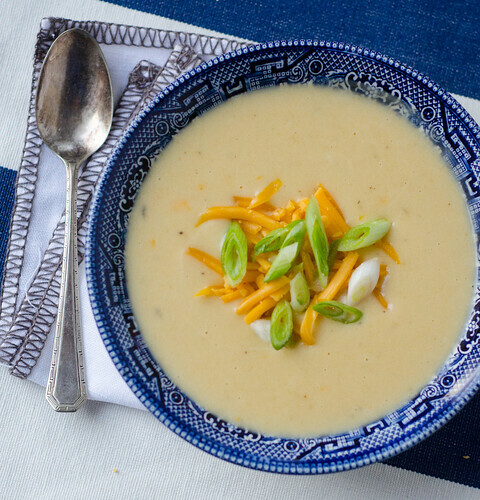 And this Potato, Cheddar, and Ale Soup is basically the perfect cold-weather comfort food. It's full of carbs, cheese, it's warm and comforting, and there's beer involved. I think that covers all the bases. 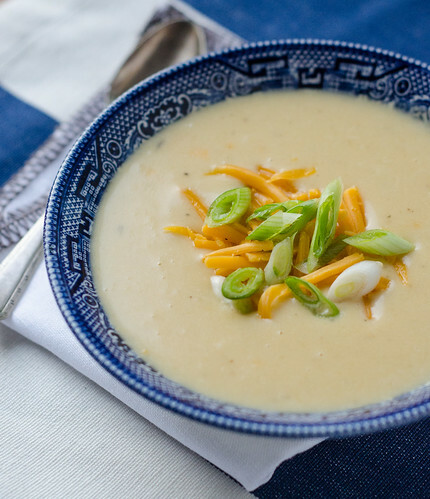 What's more, this is a crockpot meal, so it's the perfect soup to set and go. Just a few minutes of work when you're ready to serve, and you have a hot, comforting bowl of cheesy comforting goodness on the table. Winter, I may hate you, but I love your comfort food. Combine the potatoes, onion, oil, garlic, thyme, mustard, and 1 teaspoon of salt in a microwave safe bowl, and microwave 5 minutes, or until the onions are tender. Transfer the the slow cooke, and stir in the broth and beer. Cover and cook on low for 4 to 5 hours, or until the potatoes are tender. Working in 2-3 batches, puree the soup in a blender until smooth. Return the soup to the slow cooker and stir in the cheddar until evenly melted, then whisk in the cream. If the soup seems too thick, add a bit more broth. Taste and season with salt and pepper. Serve, sprinkling each serving with scallions and extra cheddar. *You really want to go with a mild lager for this. Stronger flavored ales can create a biter aftertaste. Oh no!! It's still plenty warm here in Palermo, but it's always warm! haha I'm dreading my return to the blistering cold Montreal wind. Brrrr!! Soup is needed then for sure! The cold weather definitely makes me cringe, but I do love the fact that it's soup season! This sounds like the ultimate in soup comfort. Menu: Trim the Tree & Deck the Halls! Throw a Fancy Pizza Party!